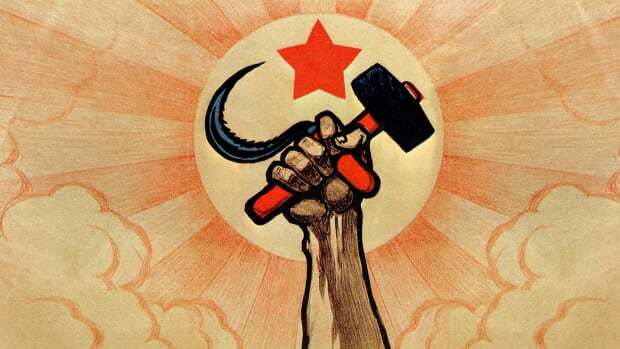 The Soviet Union had its origins in the Russian Revolution of 1917. Radical leftist revolutionaries overthrew Russia’s czar Nicholas II, ending centuries of Romanov rule. The Bolsheviks established a socialist state in the territory that was once the Russian Empire. A long and bloody civil war followed. The Red Army, backed by the Bolshevik government, defeated the White Army, which represented a large group of loosely allied forces including monarchists, capitalists and supporters of other forms of socialism. In a period known as the Red Terror, Bolshevik secret police—known as Cheka—carried out a campaign of mass executions against supporters of the czarist regime and against Russia’s upper classes. A 1922 treaty between Russia, Ukraine, Belarus and Transcaucasia (modern Georgia, Armenia and Azerbaijan) formed the Union of Soviet Socialist Republics (USSR). The newly established Communist Party, led by Marxist revolutionary Vladimir Lenin, took control of the government. At its peak, the USSR would grow to contain 15 Soviet Socialist Republics. Georgian-born revolutionary Joseph Stalin rose to power upon Lenin’s death in 1924. The dictator ruled by terror with a series of brutal policies, which left millions of his own citizens dead. During his reign—which lasted until his death in 1953—Stalin transformed the Soviet Union from an agrarian society to an industrial and military superpower. 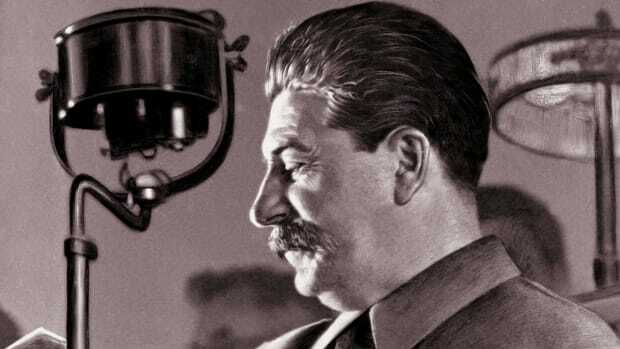 Stalin implemented a series of Five-Year Plans to spur economic growth and transformation in the Soviet Union. The first Five-Year Plan focused on collectivizing agriculture and rapid industrialization. Subsequent Five-Year Plans focused on the production of armaments and military build-up. Between 1928 and 1940, Stalin enforced the collectivization of the agricultural sector. Rural peasants were forced to join collective farms. Those that owned land or livestock were stripped of their holdings. Hundreds of thousands of higher-income farmers, called kulaks, were rounded up and executed, their property confiscated. The Communists believed that consolidating individually owned farms into a series of large state-run collective farms would increase agricultural productivity. The opposite was true. Amid confusion and resistance to collectivization in the countryside, agricultural productivity dropped. This led to devastating food shortages. Millions died during the Great Famine of 1932-1933. For many years the USSR denied the Great Famine, keeping secret the results of a 1937 census that would have revealed the extent of loss. Stalin eliminated all likely opposition to his leadership by terrorizing Communist Party officials and the public through his secret police. During the height of Stalin’s terror campaign, a period between 1936 and 1938 known as the Great Purge, an estimated 600,000 Soviet citizens were executed. Millions more were deported, or imprisoned in forced labor camps known as Gulags. 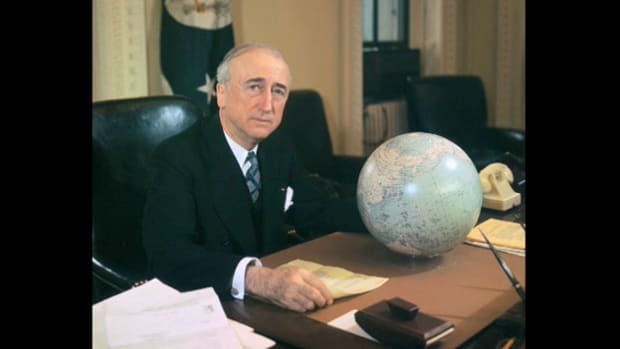 Following the surrender of Nazi Germany at the end of World War II, the uncomfortable wartime alliance between the Soviet Union and the United States and Great Britain began to crumble. The Soviet Union by 1948 had installed communist-leaning governments in Eastern European countries that the USSR had liberated from Nazi control during the war. The Americans and British feared the spread of communism into Western Europe and worldwide. In 1949, the U.S., Canada and its European allies formed the North Atlantic Treaty Organization (NATO). The alliance between countries of the Western bloc was a political show of force against the USSR and its allies. In response to NATO, the Soviet Union in 1955 consolidated power among Eastern bloc countries under a rival alliance called the Warsaw Pact, setting off the Cold War. The Cold War power struggle—waged on political, economic and propaganda fronts between the Eastern and Western blocs—would persist in various forms until the fall of the Soviet Union in 1991. After Stalin’s death in 1953, Nikita Khrushchev rose to power. He became Communist Party secretary in 1953 and premier in 1958. Khrushchev’s tenure spanned the tensest years of the Cold War. He instigated the Cuban Missile Crisis in 1962 by installing nuclear weapons just 90 miles from Florida’s coast in Cuba. At home, however, Khrushchev initiated a series of political reforms that made Soviet society less repressive. During this period, later known as de-Stalinization, Khrushchev criticized Stalin for arresting and deporting opponents, took steps to raise living conditions, freed many political prisoners, loosened artistic censorship, and closed the Gulag labor camps. Deteriorating relations between the Soviet Union and neighboring China and food shortages across the USSR eroded Khrushchev’s legitimacy in the eyes of the Communist party leadership. Members of his own political party removed Khrushchev from office in 1964. The Soviets initiated rocketry and space exploration programs in the 1930s as part of Stalin’s agenda for building an advanced, industrial economy. Many early projects were tied to the Soviet military and kept secret, but by the 1950s, space would become another dramatic arena for competition between dueling world superpowers. On October 4, 1957, the USSR publicly launched Sputnik 1—the first-ever artificial satellite—into low Earth orbit. The success of Sputnik made Americans fear that the U.S. was falling behind its Cold War rival in technology. The ensuing “Space Race” heated up further in 1961 when Soviet cosmonaut Yuri Gagarin became the first human in space. U.S. President John F. Kennedy responded to Gagarin’s feat by making the bold claim that the U.S. would put a man on the moon by the end of the decade. The U.S. succeeded—on July 16, 1969, astronaut Neil Armstrong became the first person to walk on the moon. A longtime Communist Party politician, Mikhail Gorbachev came to power in 1985. He inherited a stagnant economy and a crumbling political system. He introduced two sets of policies he hoped would reform the political system and help the USSR become a more prosperous, productive nation. These policies were called glasnost and perestroika. Gorbachev’s glasnost plan called for political openness. It addressed personal restrictions of the Soviet people. Glasnost eliminated remaining traces of Stalinist repression, such as the banning of books and the much-loathed secret police. Newspapers could criticize the government, and parties other than the Communist Party could participate in elections. Perestroika was Gorbachev’s plan for economic restructuring. Under perestroika, the Soviet Union began to move toward a hybrid communist-capitalist system, much like modern China. The policy-making committee of the Communist Party, called the Politburo, would still control the direction of the economy. Yet the government would allow market forces to dictate some production and development decisions. During the 1960s and 1970s, the Communist Party elite rapidly gained wealth and power while millions of average Soviet citizens faced starvation. The Soviet Union’s push to industrialize at any cost resulted in frequent shortages of food and consumer goods. Bread lines were common throughout the 1970s and 1980s. Soviet citizens often did not have access to basic needs, such as clothing or shoes. 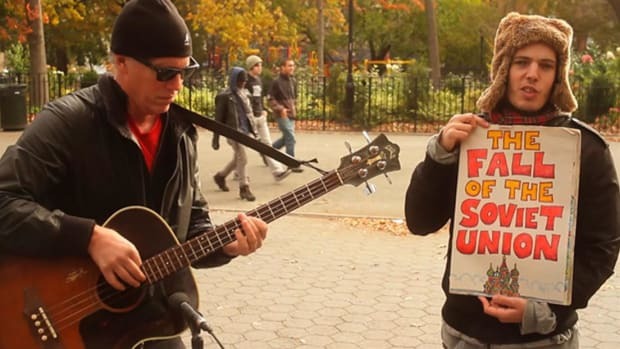 The divide between the extreme wealth of the Politburo and the poverty of Soviet citizens created a backlash from younger people who refused to adopt Communist Party ideology as their parents had. The USSR also faced foreign attacks on the Soviet economy. In the 1980s, the United States under President Ronald Reagan isolated the Soviet economy from the rest of the world and helped drive oil prices to their lowest levels in decades. When the Soviet Union’s oil and gas revenue dropped dramatically, the USSR began to lose its hold on Eastern Europe. Meanwhile, Gorbachev’s reforms were slow to bear fruit and did more to hasten the collapse of the Soviet Union than to help it. A loosening of controls over the Soviet people emboldened independence movements in the Soviet satellites of Eastern Europe. 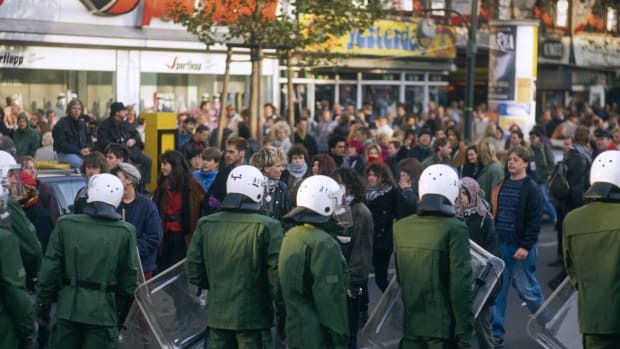 Political revolution in Poland in 1989 sparked other, mostly peaceful revolutions across Eastern European states and led to the toppling of the Berlin Wall. By the end of 1989, the USSR had come apart at the seams. An unsuccessful coup by Communist Party hard-liners in August 1991 sealed the Soviet Union’s fate by diminishing Gorbachev’s power and propelling democratic forces, led by Boris Yeltsin, to the forefront of Russian politics. On December 25, Gorbachev resigned as leader of the USSR. The Soviet Union ceased to exist on December 31, 1991. Guns or butter problems of the Cold War. CIA Library. Revelations from the Russian Archives. Library of Congress. 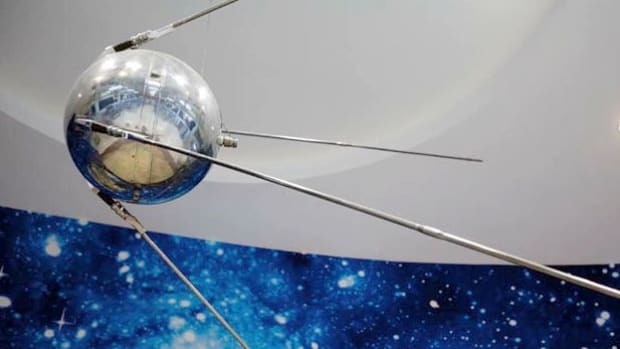 Sputnik, 1957. U.S. Department of State Office of the Historian.